To determine the rise of maximum temperature of a transformer, its load test is of utmost importance. Using suitable load impedance, small transformers can be put on full load. The full-load test of large transformers is not possible because considerable wastage of energy occurs and it is difficult to get a suitable load for absorbing full-load power. Sumpner’s test is used to put large transformer on full load. This test can also be used to determine the efficiency of a transformer. Figure 1.45 shows the schematic diagram of Sumpner’s test. This test is also known as back to back test or load test. This test requires two identical transformers. The two primaries are connected in parallel and are energized at rated voltage and rated frequency. The wattmeter W1 records the reading of core loss of both the transformers. Next the two secondaries are connected in series in such a way that their polarities are in phase opposition and the reading of the voltmeter V2 becomes zero. With the help of voltage regulator fed from source, a voltage is injected to the secondary of the transformers, which is adjusted until the rated secondary current flows. 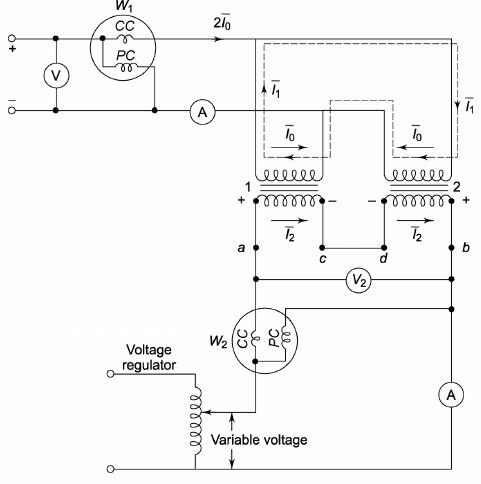 The voltmeter reads a voltage, which is the leakage impedance drop of the two transformers. The reading of W1 remains unaltered. The wattmeter W2reads the total copper (Cu) loss of the two transformers. Although the transformers are not supplying any load current, this test measures the full iron loss as well as copper loss of the transformers. The net input during this test is W1 + W2. To measure the temperature rise, the two transformers are kept under rated loss conditions for several hours.